I really wanted to like this film. 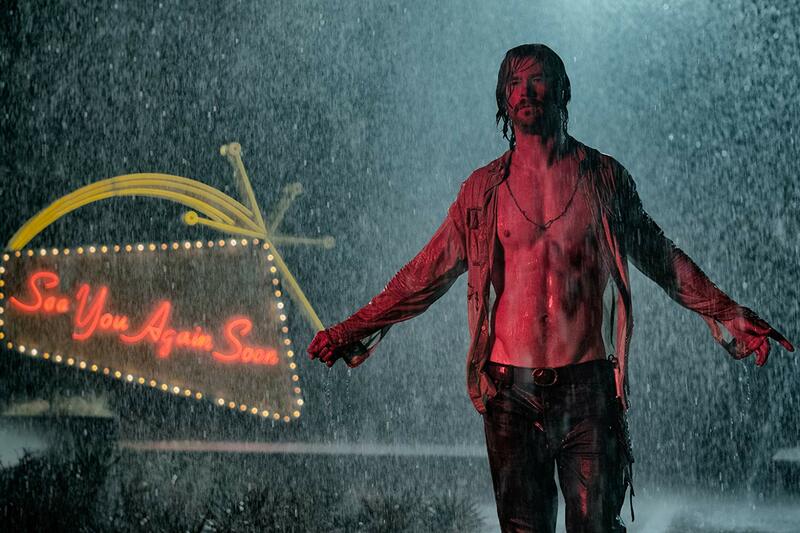 In fact, walking out of Bad Times at The El Royale, I was downright angry I didn’t like the film. Sure, there was some good in the film, but overall, writer/director Drew Goddard’s follow-up to the wonderfully-terrifying The Cabin in the Woods is an extreme letdown. One good thing about the movie is it’s stylish. It’s beautifully shot and features some eye-catching cinematography, but in the end, you can’t polish a turd. This film just isn’t that good. El Royale is a period piece, which is set in 1969. Four guests are packed into a tiny, hole in the wall hotel, which is actually a motel where the rich used to party. The El Royale lost its gaming license a year earlier, but the desk clerk, played by Lewis Pullman, acts as if it’s been years. Forget about the state line down the middle of the hotel, breaking one part off in Nevada, while the other is in California. Jeff Bridges, who plays a priest, shows up at the hotel with a confused look on his face, while Step, played by Cynthia Eriva is a singer with a suspicious past. Then, there’s STL’s own Jon Hamm who comes off like more of a douchey vacuum cleaner salesman than a decent guy. Each of these people has secrets and as the film plods along at a snail’s pace, we will find out each of their secrets. Dakota Johnson shows up in the hotel lobby looking for a room as well. It’s then that we start to find out that each person is not exactly who they seem to be. My big problem with Royale is that it’s trying too much to be like a Tarantino film without Tarantino. The plot is ridiculous, the scenes are drug out and the acting from Johnson and Chris Hemsworth is downright deplorable. Johnson has never done a solid job acting in any film I’ve seen her in. I wonder how she continues to get work? And then there is Hemsworth. Hemsworth is horribly miscast as a cult leader named Billy Lee. I’m not sure what drugs old Billy Lee is on, but he doesn’t seem to know if he wants to be Charles Manson or Jim Morrison. Hemsworth’s character is plain weird and Johnson’s character is just lame. Goddard has tried to create a Tarantino-esque film without Tarantino, something that is very impossible to do. There are parts reminiscent of Four Rooms, Reservoir Dogs and even Pulp Fiction. While that may seem like a good thing, this ode to Tarantino comes up flat and just plain lame. Now, there are some strong parts in the film. Jeff Bridges is great as a priest with a secret, while Cynthia Erivo is also quite enjoyable. Those two performances save the movie from being an outright disappointment. 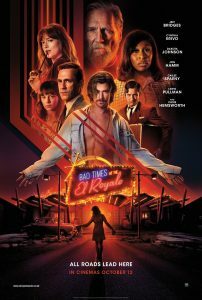 Overall, I had high hopes for Bad Times at El Royale, but much like hotels sometimes are, the film was not suitable for my expectations. Perhaps the characters should have chosen a nice Air B&B.